You now can limit your searches using 4 new scopes. The "Periodicals" scope now includes both print and electronic titles. Instead of “View Entire Collection”, Choose from the drop-down. 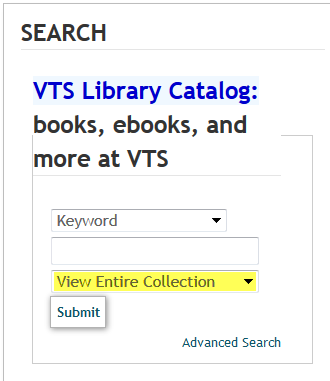 Coming soon there will also be a “VTS Publications” scope, we just need to populate the data field. Email address Enter your e-mail address to receive notifications of new posts by e-mail. This post is closed for further discussion.